LexisNexis Middle East, Arjaan Office Tower, Office 304 Dubai Media City PO Box 503246, Dubai, UAE Tel: 0568110052 Printed by Atlas Printing, Atlas Group PO Box 14833, Dubai UAE atlasgroupme.com This product comes from sustainable forest sources. Reproduction, copying or extracting by any means of the whole or part of this publication must not be undertaken without the written permission of the publishers. This publication is intended to be a general guide and cannot be a substitute for professional advice. Neither the authors nor the publisher accept any responsibility for loss occasioned to any person acting or refraining from acting as a result of material contained in this publication. A Legal Counsel talks about how different states in the region handle legal arrangements for oil and gas exploration. 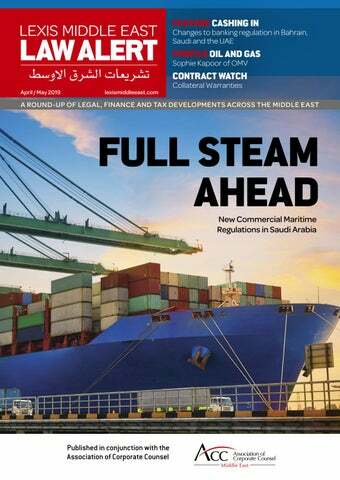 FULL STEAM AHEAD Saudi Arabia has modernised its Commercial Maritime regime with a host of new regulations which will impact maritime contracts, debt enforcement, offshore platforms and ship agents as Siri Hashem of Al Tamimi & Company explains. WHAT’S HAPPENED? LAW FOCUS priority debts or maritime liens, their time limits and how they are extinguished.” “There are also provisions on Saudi Arabia: Regulation maritime mortgages including how Imposes Fines for Ship they are registered, as well as ship Navigation Offences arrests against maritime debts and LNB News 12/12/2018 4 details of their release against a Saudi Arabia’s Public Transport guarantee. These include provisions Authority has adopted on judicial execution ship arrest and the Executive Regulations sale, shipowners’ and managers’ of the International liability and their limitation.” Convention on Standards of “In addition, these new Training, Certification and regulations cover ship master Watchkeeping for Seafarers authorities and obligations, shipping 1978 and its amendments. agent and freight forwarder rights and obligations,” Hashem states. “There is also significant detail on maritime contracts, including maritime employment contracts, charterparties, transportation of passengers by sea contracts, carriage of goods by sea contracts under bills of lading and coverage of points such as the place of filing claims and arbitration agreements under bills of lading, collisions, salvage, marine loss and general average.” “In addition, there are provisions on marine insurance contracts covering both vessels and cargo liability.” “Many of these subjects were also dealt with in the Commercial Court Regulation. However, a whole host of new maritime areas have been added to the new Commercial Maritime Regulations including marine pollution, collisions, towage, pilotage, salvage, ship agency and freight forwarding,” Hashem continues. “What is also helpful is that the regulatory language has changed and has become clearer and more modern and the procedures are also more detailed and regulated. For example, there are now distinctive provisions on licensing offshore platforms which are unprecedented compared to the maritime laws of other countries in the region. In addition, ship arrest is now a precautionary procedure which will make it a more possible and practical remedy. This will also encourage local and foreign creditors to follow and arrest vessels in Saudi Arabia in order to secure and enforce their maritime claims,” Hashem notes. “The hope is that as a result of these legal changes businesses will have a clearer understanding of the legal risk they may face and their legal rights when doing their business in Saudi, now that the legal regime in this area is more globalised and harmonised with the international legal systems which will make international trade easier, simpler and more practical for those seeking enforcement of their legal rights,” Hashem states. of investing in Saudi Arabia should be seeking proper legal advice in order to ensure they are complying with these regulatory changes, particularly in areas such as ship registry and mortgage requirements under the Commercial Maritime Regulation,” Hashem states. “They should also be looking at the new ship agent requirements under the Ship Agents Regulation. Ship agents will have to also familiarise themselves with the new operational requirements when dealing with shipments and containers and the exact legal liability they are now exposed to towards the parties to the contract of carriage and bills of lading, supporting service providers, ports management and the Saudi Ports Authority,” Hashem adds. “In addition, those who are seeking legal claims and recovery against any vessel trading in Saudi waters should start thinking of following the targeted vessels before the Saudi courts for ship arrest as long as they have first obtained proper legal advice,” Hashem states. WHAT ARE THE PENALTIES FOR NON-COMPLIANCE? “Generally speaking, the Commercial Maritime Regulations tend to regulate the legal rights and obligations of the parties to the maritime transaction and maritime claims and casualties,” Hashem states. “Part of these Regulations provides regulatory obligations for certain shipping entities and in this context, penalties will be applied for non-compliance.” “In addition, there are some particular penalties people will need to be aware of,” Hashem adds. “These include fines of between 100,000 and 1,000,000 Riyals for shipowners, managers (including bareboat charterers or masters) if their vessel flies the Saudi flag but is not registered in Saudi Arabia or if they hide, blank or erase any of the vessel’s details unless this is done to avoid captivity.” “Every offshore platform owner which could include bareboat charterers or managers can also be fined between 100,000 and 500,000 Riyals if they operate the offshore platform without the necessary safety requirements to protect personnel and the environment.” “There are additional penalties under the Ship Agents Regulations too,” states Hashem. “For example, penalties are levied on ship agents who violate the rules on licensing and business practices. Ship agents will be fined 500 Riyals for every day after the expiry of the license if they apply to renew their license after it has expired. In addition, if a ship agent does not deal with dangerous cargo under these Regulations, they will be fined 3000 Riyals for every day from the date of its arrival until it returns to its source or they destroy or get rid of that cargo,” Hashem notes. “Finally, there are fines to be aware of if port dues or supporting services are not paid within the period stipulated under the Ship Agent Regulation, which are calculated according to the value of the invoice,” Hashem concludes. CIVIL PROCEDURE LAW AMENDMENTS The UAE’s Cabinet has approved a Decision amending the country’s 1992 Civil Procedure Code (Federal Law No. 11/1992) in line with the UAE Vision 2021 and UAE Centennial Strategy 2071. The changes are aimed at strengthening and modernising judicial procedures to ensure they can be applied more easily. The amendments include unifying procedures in all civil courts across the country along with the necessary flexibility to implement judicial decisions in line with the requirements of each judicial body. They were introduced with the cooperation between the Federal Justice Ministry, the Supreme Committee of Dubai Legislation, the Judicial Councils and the Military Court. The Abu Dhabi Judicial Department, Dubai Courts, Ras al Khaimah Courts and DIFC Courts will have 100 days to reflect the amendments in their procedures. be regulated by the Dubai Financial Services Authority. The master trust housing the scheme will be based in the DIFC. GREATER POWERS FOR COMPETITION REGULATOR Saudi Arabia’s Cabinet has approved a law which will give the General Authority for Competition increased enforcement powers. Under the law, the Authority will have increased independence to act against those who violate the Kingdom’s Competition Law. It will apply to all companies except natural monopolies and firms owned by the Government and will come into force 180 days after its enactment. One of the changes will see the possibility of permanently cancelling company licenses to avoid reducing the number of competitors in a market removed. It comes as the Kingdom aims to diversify its economy and attract more foreign investment. FREEZING ORDER The Enforcement Judge at Qatar’s International Court and Dispute Resolution Centre has issued an order freezing the financial assets of a local company not registered with the Qatar Financial Centre and put the assets in the national Treasury. The Enforcement Order has been circulated by the Qatar Central Bank and orders all banks and financial institutions in Qatar to comply with the judgement imposed against the local company. The order followed a finding by the Court that the defendant had not paid agreed service fees to a Qatar-based insurance company. Companies Law will be enforced from 1 April 2019 and Oman Law No. 4/1974 will be repealed. The Authority also announced they will be responsible for enforcing all its provisions, except the registration of listed companies. The new Law was issued through Oman Sultani Decree No. 18/2019. Under it, a holding company will take the form of a joint stock company unlike previously where a holding company could be a limited liability or joint stock company. A new Article on establishing professional firms has also been introduced and special rules on how they are regulated will be issued in due course as will the Implementing Regulations to the Law. SUSTAINABLE ENERGY CENTRE Bahrain’s King has issued a Royal Decree establishing a Sustainable Energy Centre in the Kingdom. It will report to the Cabinet and will be supervised by the Electricity and Water Minister. The Centre will provide technical support to the relevant parties to preserve sustainable energy sources and enhance their effective use. It will also ensure their secure use and encourage sustainable energy investment together with the relevant authorities. The Centre’s Chief Executive Officer will be appointed by a Royal Decree for a renewable four-year term, will be the assistant undersecretary and report to the relevant Minister. LEGAL ROUND-UP amendments to the Law since its introduction in 2015.
and 200,000 Pounds, or both. Those found to use IT in a manner which prejudices the honour of a victim will be jailed for between two and five years, fined between 100,000 and 300,000 Pounds, or both. UAE: The Implementing Regulations to the Federal Law regulating the possession of dangerous animals have been issued..
Egypt’s State Council is currently reviewing the Implementing Regulations to the country’s 2018 Consumer Protection Law. Egypt Law No. 181/2018 was published in the Official Gazette in September and requires suppliers to provide consumers with an invoice and also covers sales of used vehicles. In addition, it gives power to impose relevant penalties to the Economic Court. Under the draft Regulations, controls for consumer protection will be established, ecommerce will be regulated as will sales of residential units. Competitions and misleading advertising will also be regulated, and traders will only be able to sell goods at certain prices. AMENDED LABOUR LAW Jordan’s Senate has approved an amended labour law and referred it to its joint committee to consider further. Under the amendments, there will be increased end-of-service benefits for employees and more compensation for those who are dismissed arbitrarily. Non-Jordanian labourers and offices who recruit non-Jordanians will also be supported and penalties against violators will be increased. Finally, the amendments will mean it complies with the Law on the Rights of Persons with Disabilities. report violations to the Environmental Public Prosecutor in their governorate. The appointments have been welcomed by Human Rights Watch ‘to ensure that violators of waste management laws are held accountable and those who suffer as a result have access to redress’. The organisation had lobbied the Justice Minister to publicise the names of the prosecutors in each governorate in line with Lebanon Law No. 251/2014.Although the law prohibits the dumping and burning of waste in open places, Human Rights Watch alleges Lebanese municipalities continue to participate in these practices, violating Lebanon’s obligations under international law including causing adverse health impact on the population. Residents who see environmental violations, like dumping and burning in open areas, can fill out a complaint form developed by the Environment Ministry and file a complaint either by mail or by hand to environmental prosecutors in their governorate. RECENT LEGAL DEVELOPMENTS IN THE GCC SAUDI ARABIA CRIMINAL PROCEDURE Saudi Arabia’s Cabinet has approved a new domestic abuse law. It will allow claimants in domestic abuse cases to ask for a psychologist to attend proceedings to listen to testimonies. Under the law any one convicted of domestic abuse will be jailed for up to a year and fined 50,000 Riyals. BAHRAIN - EMPLOYMENT Bahrain’s House of Representatives has approved a draft law requiring a good conduct certificate for foreign workers and returned it to the Shoura Council to reconsider. The Council had rejected the proposal in January. If approved, foreign workers will have to submit a certificate issued by the relevant authorities in their country on any criminal convictions they have. QATAR - AUDITING Qatar’s Cabinet has approved a draft law regulating the auditing profession and referred it to the Shoura Council to consider. If approved, it will replace Qatar Law No. 30/2004 regulating the auditing of accounts. It includes provisions relating to auditors' records, rights and duties and conditions and procedures for registration. It states compliance will be required no more than six months after the law’s implementation. KUWAIT INSURANCE Kuwait’s National Assembly has approved a draft law which will mean tourists visiting the country will have to have a health insurance policy covering the duration of their stay there. The aim is to ensure tourists do not receive medical treatment in the country. A visit visa cannot be granted until the Interior Ministry has seen the health insurance policy documents. The amount of coverage required has not been specified. provided for under the current DIFC Employment Law. Certain changes are intended to rectify unintended consequences of the current wording of the DIFC Employment Law, whereas others are being introduced from a compliance and enforcement perspective, including the right for the DIFC Authority to inspect DIFC companies’ premises and records and impose fines (up to $10,000) for non-compliance. One of the most important developments is the proposed expansion of the anti-discrimination provisions of the DIFC Employment Law. In particular, under the proposed new law there will be additional protected characteristics and the introduction of various remedies including court declarations, recommendations and most importantly, significant monetary compensation for an employee who has suffered unlawful discrimination. The UAE’s Federal National Council has approved a draft federal law regulating medical professional practice in the country. It will apply to all those who practice or request to practice the profession both onshore in the UAE and in the free zones. The aim is to protect patients from illegal medical practices and put the legal foundations for practising in place to ensure the highest medical services are provided. Oman’s State Council has reviewed a draft statistics and information law. The aim is to keep up with international developments in this area and update Oman Sultani Decree No. 29/2001. It is aimed at providing authoritative official statistics in all areas, contributing to the updating of statistical indicators which should enable the authorities to keep up with rapid information developments and help establish national standards for official statistics. LIFE INSURANCE REGULATIONS CONSULTATION The UAE’s Insurance Authority has published the third draft of its Life Insurance and Family Takaful Regulations. The aim is to provide better protection to investors and overhaul the selling of savings, investment and life insurance policies. Commentators from leading UAE firms in the country have said the latest version was not radically different from the current one and could be the final version. If approved, these changes will include caps on commission paid to financial advisers selling lump sum investments as well as fixed-term contractual savings plans, with payments made in increments rather than in an initial lump sum made over the term of the product rather than paid upfront. There are also provisions on how customers should be made aware of fees and commissions. Sales advisers will have to provide customers with a detailed fees schedule and commissions for a policy’s entire life cycle and customers will have the option to cancel a policy within 30 days. Commissions paid upfront to advisers on the full value of an insurance policy will also be restricted to 50% of the annual premium in the first year with the rest distributed over the product’s term. No date for the implementation of the changes has been given. However, a consultation on the proposals which includes a cap of 4.5% on the sale of lump sum portfolio bonds or offshore bonds by advisers from financial companies which will now be replaced by commission payments of up to 10% paid by some insurers to the advisers on the sale of their products has been launched. imports of rebar and steel coils into the UAE through Dubai Customs Notice No. 1/2019. An amendment to this notice has been published via Dubai Customs Notice No. 2/2019. This notice has adjusted the Harmonised System codes impacted by the rate increase, resulting in a change in the product types affected. The amendments have retrospectively come into effect from the date of the original duty increase which was 17 January 2019. BANK TAX INCREASE Sources have said Saudi Arabian authorities are considering increasing Zakat paid by local banks to 20%.This would be double the current rate and would mean foreign and local banks would pay the same amount. If approved, this will follow an increase in Zakat last year to cover items which were previously exempt. Local banks started paying Zakat at 10% of their profits after deducting returns on Government bonds last year as part of a settlement with the General Authority for Zakat and Tax. Authority's Indirect Tax Expert, Samy Nasr that VAT will be introduced in the country but no timeframe was given. INCOME TAX LAW IMPLEMENTING REGULATIONS Implementing Regulations clarifying certain provisions in the Income Tax Law have been published in the Official Gazette. The new Regulations are contained in Oman Ministerial Decision No. 14/2019. Amendments include changes on withholding tax, the deductibility of expenses, tax exemptions, administrative procedures and the tax ability of an enterprise. They also prescribe new forms for providing or updating taxpayer information and procedures for obtaining a tax card, electronic filing and onsite inspection. They generally apply from 11 February 2019, although some apply retroactively to tax years beginning on or after 1 January 2018. Taxpayers should familiarise themselves with the amendments and their implications when filing tax returns. TAX AND FINANCE ROUND-UP Tax Department’s portal once the forms are available online. CAPITAL ADEQUACY REGULATIONS Kuwait’s Capital Markets Authority has launched a project to prepare capital adequacy regulations in the country in line with international standards. If approved, they will apply to licensed persons. The move is in line with the Authority’s mandate under Article 66(2) of Kuwait Law No. 7/2010 and Article 64 of Kuwait Law No. 7/2010. VAT ON MEDICAL DEVICES Bahrain’s National Health Regulatory Authority has published a Circular stating medical devices are zero-rated for VAT purposes and includes a list of medical devices which the policy applies to. The Authority previously published a Circular which indicated registered medicines and approved health products are zero-rated. Healthcare businesses should familiarise themselves with the healthcare goods which are zero-rated and ensure they apply the correct VAT treatment to their supplies to avoid significant penalties for non-compliance. TAX TREATY UPDATE Saudi Arabia: The details of the long-awaited double tax treaty between the UAE and Saudi Arabia which was signed on 23 May 2018 have been announced. UAE: Argentina issued a Law approving its double traxation treaty with the UAE which was signed in Dubai on 3 November 2016.
operating in Lebanon of all types and nationalities and at branches and representative offices abroad, as well as to companies and financial institutions with public servants or auditor owners, beneficiaries or partners, or their relatives. Those covered by the legislation will have to register with Banque du Liban and declare their relevant interests. Those who do not comply will see their directors potentially jailed for up to six months and fined. TAX FINE EXEMPTION DEADLINE EXTENSION Jordan’s Council of Ministers has extended the tax fine exemption deadline until 31 March. It has been confirmed this will be the last extension. Late payees will be able to pay their outstanding taxes in instalments up to 31 December 2019.
development and free zones for contributing to tax evasion in the country by distorting the tax environment. TAX PROCEDURES LAW CONSULTATION Egypt’s Finance Ministry has prepared a unified tax procedures law and is referring it to the Prime Minister before posting it on the Ministry’s website for a public consultation, which ended in March.The law establishes mechanisms for applying electronic billing for VAT and real estate taxes. It will also automate the Tax Authority’s processes by installing commercial offices to calculate electronic billing. It is intended to facilitate procedures for linking the collection of income tax, VAT, stamp duty, and other fees. It will also apply to tax disputes. FINANCIAL LEASING SUPPORT The Governor of Libya’s Central Bank has discussed ways to reintroduce financial leasing after an eight-year gap. A Capital Market Authority member said financed leasing had been suspended in 2011 despite Libya Law No. 15/2010 regulating it. Competence over leasing was granted to the Central Bank in the 2012 Banking Law. Financial leasing is defined as an in-kind financing transaction for ‘capital assets’ carried out under a contractual relationship between the owner and the lessor in return for a sum, over a certain period and ending with ownership agreed by both parties. The Central Bank will provide credit facilities for future leasing arrangements. Financial regulators in the UAE, Saudi and Bahrain issued a whole host of important changes in late 2018. Tom Bicknell, Partner and Marie Chowdhry, Associate at Pinsent Masons explain why and the impact they may have. Our client is a global multinational who are looking to hire a Legal Adviser to review, advise, prepare a wide variety of legal documents and contracts. International law firm and / or in-house experience and Arabic language skills are essential. A degree and / or masters in law, ideally from Europe or the US would also be an advantage. Our client is a large global diversified sector conglomerate. They are looking to hire a Senior Legal Counsel draft and negotiate commercial contracts relating to a wide range of complex projects / joint ventures and agreements. The role will have significant autonomy, and will require strong interpersonal and communication skills, as you will be liaising daily with high profile external and internal stakeholders. The successful candidate will have a US or UK qualification, and will have trained at an International law firm and / or well-known Multinational organisation. Arabic language skills are essential. We are working on a range of project finance and/or project development associate roles with major law firm clients to join their busy teams in Dubai and Abu Dhabi. You will ideally be Western qualified and have experience and trained gained with a reputable law firm. This continues to be a busy practice area and we have a number of law firm clients who wish to recruit high calibre associates keen to work on some of the largest and most complex matters in the region. Attractive benefits and long term prospects. LAW FOCUS dual-regulated. However, most Central Bank-licensed firms would be consulting with the Bank ahead of any such move into another regulated space anyway, so it is unlikely to change things from a practical perspective.” “A long-standing principle of the UAE's financial services regime was the ability for foreign entities to sell their financial products into the market without a license, provided their activities fell strictly within the parameters of the so-called 'tolerated practice',” Bicknell states. “While never formally acknowledged by regulators, the tolerated practice provided direction around what effectively constituted carrying on the promotion and sale of financial products into the UAE (i.e. having staff on the ground, entering into contracts in the UAE, targeting and advertising to the public at large). Using the same wording as the SCA's financial promoting regime introduced during 2017, Federal Decree-Law No. 14/2018 now provides for a blanket prohibition on the promotion of any product or service requiring a license under the law. Although the law provides some revised Banking Licensing Guidelines and limited exemptions to this prohibition, it Minimum Criteria from the Agency which effectively shores up any regulatory lacuna mean the banking sector in the Kingdom is which previously existed between the now open for new entrants to access the Central Bank and SCA regimes.” market," Bicknell states. “Federal Decree-Law No. 14/2018 "This announcement comes at a time makes it clear that, notwithstanding Tom Bicknell when direct foreign investment in Saudi any harsher punishment provided for in Arabia is expected to increase in line with the Partner any other UAE federal law, the Central Pinsent Masons Government's Vision 2030 plan to diversify Bank’s enforcement powers have been its income resources away from dependence strengthened so it can impose a range of on oil to promote a sustainable economy and administrative and financial sanctions on turn the country into ‘a global investment institutions which operate in violation of powerhouse’. SAMA's Governor has also the new requirements. In particular, the announced they will soon launch a public Central Bank has the power to issue fines consultation on the fifth upgrade of the rules and seek criminal sanctions against any for opening bank accounts and the general Marie Chowdhry rules for their operation in commercial banks license holder who carries on business outside the scope of its licence or falsely Associate in the Kingdom soon.” operates as a licenced entity,” Chowdhry “The revised Guidelines set out the Pinsent Masons states. Agency's minimum licensing criteria for “To date, there have been no reported instances applicants seeking to carry on banking business in of the Central Bank using these new enforcement the Kingdom. They outline the general guidelines powers.” required. They also detail the minimum criteria to be addressed by applicants, and the application SAUDI ARABIA procedures and the required information to be “Over in Saudi Arabia there have also been changes submitted with an application. Foreign banks may as the Saudi Arabian Monetary Agency (SAMA) the continue to apply to establish branches in the financial regulator published in December 2018 Kingdom, although the applicant in these instances will be the parent entity. However unless as explicitly stated in the Agency’s prudential standards, all foreign bank branches will be subject to the same legislative and prudential requirements as locally Article 136 of Federal Decree-Law No. 14/2018 incorporated banks. Although it is worth noting foreign An independent Grievances & Appeals Committee will be established in bank branches are not required to maintain capital in line with this Decree-Law under the chairmanship of a Court of Appeal the Kingdom, but the Agency does reserve the right judge. 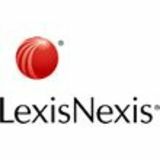 to set capital requirements on a case-by-case basis," (Source: Lexis Middle East Law) Bicknell states. "In particular, the Guidelines note capital adequacy requirements may be required from foreign bank branches intending to conduct high risk business and/ or those wanting to specialise in particular business lines which require specific levels of capacity or competence. The Guidelines do not explicitly set out what activities are intended to be covered here but the Agency could be expected to impose local capital adequacy requirements on foreign bank branches conducting banking business which may impact a large number of consumers or could impact the financial stability of the wider market, for example, provision of credit and deposit taking activities.” “While the Guidelines are clear prime responsibility for oversight of foreign bank branch operations in Saudi Arabia is the responsibility of local branch management, and the foreign bank branch's home supervisor, the foreign bank branch must also comply with all the Kingdom's statutory laws. In addition, foreign bank branch applicants must obtain written consent from their home supervisor to establish banking operations in the Kingdom before an application for a licence will be considered." "At the last count, there are 13 domestic banks licensed to operate in the Kingdom, but only 11 foreign banks licensed to operate foreign bank branches. These figures may change as a result of the announcement and new Guidelines,” Chowdhry adds. January 2019 and must commit to having arrangements in place to comply with the Open Banking Regulations by 30 June 2019.” Bahrain: Consultation on “This short timescale may have Draft Digital Financial Advice been driven, in part, as a result of the Directives Launched Central Bank’s partnership with and LNB News 22/01/2019 9 in-principle confirmation which was Bahrain’s Central Bank has given to the country's first domestic launched a consultation on open banking infrastructure provider, draft Digital Financial Advice Almoayed Technologies. Since April directives. The consultation 2018, in partnership with Token.io, ended on 20 February 2019. Almoayed Technologies has been If approved, they will enable working with the Central Bank in its licensees to use technology to ‘regulatory sandbox’ environment, to offer financial advice to their help prepare Bahraini banks for the clients. launch of open banking. It is understood Almoayed Technologies has already connected 11 banks via a single open banking API since the Open Banking Regulations were finalised. The Open Banking Regulations are loosely based on the regulatory technical standards for strong customer authentication and common secure open standards of communication which underpin the reforms provided for in the EU's second Payment Services Directive (PSD2). Like under PSD2, retail banks operating in Bahrain will need to ensure they only provide access to customer accounts where customers give their consent. Bahrain’s Open Banking Regulations however, go further than the EU's customer authentication standards, by requiring threefactor authentication, not just two. It remains to be seen how this will affect the customer experience, and the way in which the Almoayed Technologies API, which is quickly becoming the common API standard being adopted by domestic banks in the country, will address this concern,” Bicknell concludes. WHAT HAPPENED? On 13 June 2018, the claimant, Ali & Sons Marine Engineering Factory, a UAE-based specialist marine manufacturing business, which is owned by Ali & Sons Holding Company LLC, started an action before the Dubai Court of First Instance (DCFI), for nullification of a partial award on jurisdiction rendered in favour of the defendant in the proceedings E-Marine PJSC, a Dubaibased maritime crewing company, by a three-member tribunal in DIAC Case No. 103/2016 on 25 February 2018 (the Partial Award). The Partial Award confirmed the Tribunal’s subjectmatter jurisdiction over counterclaims advanced by E-Marine in the arbitration and awarded arbitration costs and fees against them. The counterclaims arose from a number of defects in the quality of a ship built and delivered by Ali & Sons for E-Marine under a contract dated 13 August 2012. The DCFI held that by analogy to Article 151 of Federal Law No. 11/1992 (the UAE Civil Procedures Code), which prohibits challenges of interim or partial judgments bar in exceptional circumstances (as such a negative judgment on jurisdiction, i.e. a final judgment denying the jurisdiction of the court) a partial award affirming arbitral jurisdiction cannot be challenged. The claimant’s application for nullification of the partial award was premature as no final award had been issued in the arbitration. The DCFI confirmed final as opposed to partial awards could be challenged either in a stand-alone action for nullification under Article 216 of Federal Law No. 11/1992 or in response to an action for enforcement under Article 217 of Federal Law No. 11/1992. WHY’S IT SIGNIFICANT? This case confirms only final awards on jurisdiction can be challenged under Articles 216 and 217 of Federal Law No. 11/1992. However it is important to note, these articles have been repealed by the recent adoption of UAE Federal Law No. 6/2018 on Arbitration, also known as the UAE Federal Arbitration Law, which came into force on 16 June 2019. Articles 53, 54, 55 and 57 of Federal Law No. 6/2018 introduce a new streamlined enforcement and challenge regime for domestic awards, applications for nullification and enforcement being lodged before the competent court of appeal and not as used to the case under Federal Law No. 11/1992 the competent court of first instance, with appeal to cassation only. Article 59 of Federal Law No. 6/2018 limits the temporary application of the law to arbitration proceedings (as opposed to arbitration-related court actions) pending or following its adoption. As the present application for nullification had been initiated three days before Federal Law No. 6/2018 came into force, the DCFI considered it under the old Civil Procedures Code (which, technically speaking, was repealed with effect from 16 June 2019). By analogy, it is safe to conclude any challenge (or enforcement) actions started before Federal Law No, 6/2019 came into force will follow the old procedural regime under Article 216 and 217 of Federal Law No. 11/1992 and not the more streamlined regime introduced by the new Arbitration Law. If started after that date, the subject award will benefit from the streamlined challenge and enforcement procedure under Federal Law No. 6/2018. In addition, unlike the position under the old regime, in terms of Article 39(1) of Federal Law No. 6/2018, a tribunal is expressly empowered to adopt partial awards (including on jurisdiction), which are arguably enforceable as such (whether affirming or denying arbitral jurisdiction) in line with Article 39(2). Article 39 likely extends to challenge scenarios. WHAT HAPPENED? The Dubai Public Prosecution (DPP) charged a medical practitioner with malpractice. This was in relation to a criminal complaint filed by a patient who claimed he had sustained injuries and permanent disabilities as a result of surgery performed by the medical practitioner. The claimant who was a patient filed a criminal complaint against the defendant doctor accusing them of malpractice. The claimant noted that the defendant performed an operation to treat their back as they suffered from a herniated disc in their spinal cord and the medical operation resulted in permanent disabilities and other repercussions for the claimant, such as involuntary urination and defecation along with other injuries. Following receipt of two reports from the Dubai Health Authority and the Higher Committee of Medical Liability, the DPP issued an indictment order against the defendant for medical malpractice for not following standard medical procedures, which resulted in cutting some nerves in the spinal cord. The DPP relied on Article 1, 3, 6 and 34(1) of Federal Decree-Law No. 4/2016 on Medical Liability. WHAT WAS DECIDED? Given there was no evidence of a ‘gross’ medical error, the defendant argued they should not be found criminally liable. However, the Court of First Instance rejected these arguments and found the defendant guilty and ordered them to pay 200,000 AED. The defendant appealed and the Court of Cassation supported the Court of First Instance’s judgment. The Court of Appeal overturned the initial judgment and acquitted the defendant of all charges as it could not be satisfied a ‘gross’ medical error had been committed. The DPP have challenged the judgment by way of an appeal and it is expected to be reviewed soon by the Court of Cassation. WHY’S IT SIGNIFICANT? The key principle from the judgments issued in this case was that criminal liability under Article 34 of Federal Decree-Law No. 4/2016 arises against a medical practitioner only if the medical error (as referred to in Article 6 of Federal Decree-Law No. 4/2016) is ‘gross’. In light of the above judgments, although the criteria for ‘gross’ medical error is yet to be defined by the Implementing Regulations of Federal Decree-Law No. 4/2016 and the Medical Liability Committee is to decide whether or not a medical error was committed in addition to the extent of the gravity of an error, the existing Higher Committee of Medical Liability can still, for the time being, determine if the medical error is gross or not. WHAT HAPPENED? In February 2019, we were awarded a favourable judgment by the Abu Dhabi Criminal Court of First instance acquitting the defendant of all criminal charges against them by the Public Prosecutor. The accused was charged under Article 40, 34, 39, 7, 6, and 2 of Federal Law No. 14/1995 on Countermeasures against Narcotic Drugs and Psychotropic Substances. The facts stated the accused received a package from Abu Dhabi customs where he was detained because of drugs in the shipment. Abu Dhabi Customs handed the accused over to the Public Prosecutor for further investigation. The Public Prosecutor confirmed the package contained some documents along with narcotic substances. A report against the defendant was then submitted before the Criminal Court of First Instance. The defendant refuted all the charges filed against him on the grounds he was unaware of the substances in the package and had no intention of committing a felony. The matter was reviewed and adjudicated upon by the criminal court on the basis of merits. WHAT WAS DECIDED? Intention to commit an offence had to be critically scrutinised by the criminal court of Abu Dhabi in the light of the available facts. The court had to determine whether or not the defendant had the knowledge of the narcotic drugs being present in the package and intended to utilise them as his urine test was negative. The court stressed the fact the crimes mentioned under the Narcotic Drugs Law should be deliberate crimes and the defendant must possess the criminal intent to commit an act. In these circumstances, the court cannot assume or consider an accused guilty unless proven otherwise through substantial evidence. The court also relied on the principle furnished by the Supreme Court emphasising the responsibility of having narcotic substances and the defendant should have a clear connection with the substances or must control their possession through a mediator. The principle also highlights the defendant must, at all times have knowledge the substance is a narcotic substance or they are in possession of a narcotic drug. If they fail to prove this the defendant will be found not guilty. Relying on these principles, the criminal court acquitted the defendant and held that bearing in mind the lack of criminal intent and the knowledge of possessing narcotic substances they were not guilty. WHY’S IT SIGNIFICANT? A criminal is an innocent unless proven guilty and this is the principle which makes this case significant. The criminal court interpreted the UAE Narcotic Drugs Law, Federal Law No. 14/1995 in line with criminal jurisprudence and stressed the fact the court should not assume the culpability of a defendant unless their guilt is proven beyond reasonable doubt. The New Gold Rush Sophie Kapoor, Legal Counsel of Middle East and Africa for OMV Middle East & Africa GmbH talks about how different states in the region handle legal arrangements for oil and gas exploration. After graduating with a BA from Oxford University in 2010, I obtained my LLB from the University of Law, London. I began my legal career on a multi-jurisdictional platform at Pinsent Masons LLP, working between the Dubai and London offices, before moving to Ashurst LLP in Dubai. During my time in private practice, I specialised in corporate projects, specifically across the energy, transport and infrastructure sectors. While at Ashurst, I was seconded to OMV Middle East and Africa GmbH; the Middle Eastern hub of OMV Aktiengesellschaft, and accepted a permanent role as legal counsel for the Middle East and Africa (MEA) region last year. YOUR BUSINESS OMV produces and markets oil and gas, innovative energy and high-end petrochemical solutions. With group sales of 23 billion Euros and over 20,000 employees in 2018, we are one of Austria’s largest listed industrial companies. With regard to OMV’s activities in MEA, in Yemen we hold four exploration and production licences and resumed production in 2018. In Libya where our activities date back to 1975, OMV holds licences in the Murzuq and Sirte basins, and is currently redeveloping the Nafoora-Augila field; in 2018 we were able to ramp up production to an average of 30,000 barrels of oil equivalent per day. In Abu Dhabi we work in close partnership with ADNOC. Last year we signed a $1.5 billion, 40 year agreement for a 20% stake in SARB and Umm Lulu concessions and in January, OMV and ADNOC signed a $2.5 billion agreement for OMV’s acquisition of a 15% share in Abu Dhabi Oil Refining Company and a 15% share in a to-be-established trading joint venture, which granted OMV a stake in the fourth largest single site refinery globally. of oil and gas sector work, including corporate, commercial, projects, construction, disputes, compliance and regulatory. I practice across both civil and common law jurisdictions, which have varied levels of maturity. Due to the cross-border nature of my work, I must often ensure compliance with various legal jurisdictions in one agreement, which is no mean feat. My day-to-day work at OMV includes negotiating with external parties including global national oil companies, our joint venture partners, and contractors for a variety of oil and gas services. Internally, I advise various departments in respect of upstream oil and gas legal issues, and domestic and international ventures. I am also the compliance officer for OMV Yemen, where I ensure that our business is taking positive steps to comply with applicable laws and ethics, in the industry. JURISDICTIONAL DIFFERENCES Many of the less mature jurisdictions in which I work suffer from political instability and uncertainty in government policy, which have to be considered when agreeing the terms of the contract. I relish the creativity in practicing law across the MEA region: the legal systems are not as refined as their western counterparts and this leaves the legislation open to greater interpretation, requiring original solutions to the legal problems encountered. the transfer of gas condensates and liquids. This does not include local distribution networks and pipelines created by a non-gas producer, after the official point of sale. Article 6(f) has been amended so as the tax base of an individual engaged in the production of oil and hydrocarbons will be their taxable income from that activity less allowable expenses under this law and will not include the tax base related to their investment in natural gas. A new Article 6(g) has also been added stating the tax base of an individual engaged in the field of natural gas investment will be their taxable income from the field of Natural Gas Investment less allowable expenses under this law. This tax base is independent of the tax base relating to their other activities. An amendment to Article 7(b) means the tax rate for a taxpayer engaged in Natural Gas Investment will be 20%. A new Article 7(e) has also been added which states the tax due on individuals engaged in the Kingdom, both in oil and hydrocarbons and Natural Gas Investment will be the sum of the tax due on both tax bases in line with Article 7(b) and (c). Article 8 has been amended to state additional income derived from activity in the field of Natural Gas Investment, is the total income from the sale, exchange or conversion of natural gas and its liquids and condensates, including sulphur and other products and any other income the taxpayer earns from an incidental or non-operating source related to its principal activity, its type and source, including income from exploitation of surplus capacity in one of the facilities of Natural Gas Investment activity. A new Article 21(d) has also been added stating net operating losses arising from Natural Gas Investment activities cannot be offset against the tax base of oil and hydrocarbons activities or vice versa. recover its costs, and the remaining oil is then divided with the state in line with the terms of the agreement. In Iran, Iraq and Kuwait, we commonly see service contracts in place. Again, under such agreements, the IOC provides technology and upfront capital investment, while the state maintains sovereignty rights over its natural resources. The remuneration paid to the IOC, is typically by way of a service fee, or payments based on the value produced. In the UAE, each Emirate has its own policies, on the development of oil and gas. In Abu Dhabi a state-owned company (ADNOC) is granted a concession to explore, develop and produce oil and gas and IOCs are granted a stake in such concession (the company usually has minority participation rights with ADNOC holding a minimum of 60% participation rights). These IOCs will, in a similar way to the production sharing agreements, be required to provide new petroleum technologies, know-how and professional training. While royalty is payable in Abu Dhabi, the IOC is not usually entitled to cost-recovery but will share in the profits in line with its participating interest in the applicable concession. TWO HEADS ARE BETTER THAN ONE Abdullah Mutawi has been appointed as the joint head of Al Tamimi & Company’s Corporate Commercial practice. Abdullah will co-lead the practice with Gary Watts, the current practice area head who is expected to retire from the firm at the end of June 2019. Abdullah has 25 years’ experience as a corporate finance, M&A and private equity lawyer and has led various transactions in the energy, infrastructure, transportation, industrial and retail sectors. He combines this with strong expertise in telecommunications and technology investments and venture capital deals. In the past, he has also worked for a number of law firms including Norton Rose Fulbright, Trowers & Hamlins, and Baker Botts. financial institutions on US anti-money laundering, sanctions, and know-your-customer laws and regulations. He will be joined by Alishia Sullivan, who has lived in the UAE for over 10 years’ and represents institutional investors primarily in the Middle East in investments in private investment funds, including private equity, hedge, infrastructure, and real estate funds, and co-investments. She also advises local and international clients on a variety of corporate and commercial transactions, including mergers and acquisitions, as well as the legislative and regulatory considerations and alternatives applicable when operating in the UAE and broader Middle East marketplace. Jay Gladis who provides cross-border corporate transactional advice after decades of service in the Middle East, Japan, and the United States will also be part of the new team along with four associates. MOVERS AND SHAKERS internationally across a wide range of different industry sectors including hotels & leisure, technology and pharmaceuticals. Differentiate Yourself: Skills for the 21st Century Inhouse Counsel – The ACC Middle East held a number of sessions on key skills for inhouse counsel. The first session looked at strategic communication and listening while the second looked at today's inhouse counsel role. The third session focused on partners and the future evolution of external counsel relationships. English and US law, and leading jurisdictions in the Middle East, such as the attorney-client, litigation and work product doctrines. Attendees were provided with best practices on privileged materials both in litigation and in dealing with internal clients. UPCOMING EVENTS For upcoming events please visit http://www.acc.com/chapters/middleeast/index. cfm?eventID=all or email Tam at manager@acc-middleeast.com. advising on arbitrary dismissal claims, preparing for DIFC employment litigation and assisting clients with disciplinary hearings. She also assists in drafting various HR policies, staff handbooks, settlement agreements, employment contracts and giving general employment advice. CROSSING THE TS Andersen Global has expanded its Global Board of Directors by adding Lena Hamdi, Partner at Andersen Tax & Legal in Egypt as a new board member. Lena will join 10 other top tax and legal advisers on the Global Board and their appointments will provide additional regional representation and diversity as Andersen Global continues to grow. Lena is based in Cairo. She has extensive experience with foreign investment, market entry strategies and investment advice. She leads the firm’s Global Relations department in Egypt and serves as a key liaison and adviser on expansion related matters in Egypt and the Middle East. Andersen Global currently has a presence in six countries across the region and has plans for further expansion. THINKING TAX Joanne Clarke will join Pinsent Masons’ Dubai Office as Tax Director (VAT). Joanne previously worked at PwC where she spent nine years in the Dublin office before becoming a Senior VAT Manager. She has over 11 years’ experience advising clients across various industries on VAT compliance, structuring and technical matters. Her work ranges from basic manual returns to the most modern tax engines for compliance automation. She is highly experienced in assisting clients on a broad range of issues and challenges relating to VAT compliance. She also has know-how on collaborating with tax authorities across a range of jurisdictions in order to obtain resolutions for clients. She has supported a number of different companies ranging in size from SMEs to large corporate multinational groups, with their VAT implementation in the Gulf and post implementation compliance. ollateral warranties are part of a contractual set-up of large projects in the Middle East, including in Qatar. Their main purpose is to give directly enforceable rights to third parties, who have a material interest in the proper performance of a contract but are not a party to it. These third parties typically include project funders or off-takers, who may be interested in the project’s long-term viability, as well as various project stakeholders, including employers or tenants who often require collateral warranties from key subcontractors of the Engineering, Procurement and Construction (EPC) contractor. With collateral warranties the warrantor promises a beneficiary they have complied and will continue to comply, with their obligations in the underlying contract. This creates direct legal recourse between a warrantor and the beneficiary, who may then rely on the contract terms in the main contract in the same way that they would do if they were a party to it. Ideally, this promise should not be subject to any qualification. taking account of the warrantor’s contribution to the overall damages. They also include copyright and use of information clauses, which provide third parties acquiring interests in construction projects with the right to use the design information generated by the project. There is 'no termination' clause, where the warrantor undertakes not to terminate the underlying contract without first giving the beneficiary notice specifying ground for exercising or seeking to exercise the right and they often provide a statement of the amount due to the warrantor under the underlying contract but which remains unpaid at the time of the notice. There are also 'no variation' clauses, where the parties to the underlying contract undertake to the beneficiary not to materially vary or depart from the provisions of the underlying contract without their prior written consent and step-in rights, which entitle the beneficiary to remedy an omission or default of the warrantor’s contract counterparty and/or to step into the underlying contract in place of the warrantor’s contract counterparty. The purpose of this is to allow the beneficiary to, e.g. cure and complete the project. Step-in clauses should also detail the notice period within which the step-in must be exercised. Finally, there is an assignment clause, so the beneficiary can assign the benefit of a warranty to third parties, e.g subsequent owners, tenants or funders. Collateral warranties are generally enforceable under Qatar law and are often used there, by entities including the Public Works Authority (Ashghal) and Qatar Rail. The general principle in Article 171 of Qatar Law No. 22/2004 is that of pacta sunt servanda, or ‘freedom of contract’. The MENA Business Law Review is the indispensable LexisNexis quarterly journal, dedicated to business law in the Middle East & North Africa zone. Each issue contains a full overview of the latest legal developments in the region, as well as a wide range of authoritative articles. In its two years of existence, the MENA Business Law Review has published more than 160 articles, covering a spectrum of current topics. The magazine is under the scientific direction of 15 legal professionals that include lawyers, professors, arbitrators, and notaries. DATE/SIGNATURE I will pay upon receipt of invoice. Offers sound proof, secure hearing facilities, hot desks, transcription services, etc. The secretariat is comprised of 3 lawyers, a commercial shipping executive and qualified accountant EMACâ&#x20AC;&#x2122;s arbitrators and mediators are highly-experienced and independently vetted, to ensure that parties receive the right resolution to the disputes so that they can get back to business as usual faster. A round-up of legal, finance and tax developments across the Middle East.